A 48-year-old male with ischemic superotemporal branch retinal vein occlusion (BRVO) in the right eye with no known systemic disease had been managed with sectoral laser photocoagulation. His 55 degree multicolor fundus image on follow-up shows a large neovascularization of the disc exerting traction over the macula. Laser marks are seen superiorly. Optical coherence tomography angiography (OCTA) shows the neovascular frond and nonperfusion area. Owing to traction, the vascular architecture is distorted [Figure 1]. Although retinal vein occlusion is common in the elderly, it is also seen in younger population. Younger patients with BRVO need a careful clinical evaluation for associated systemic diseases. They may have associated atherosclerosis, diabetes, or hypertension. 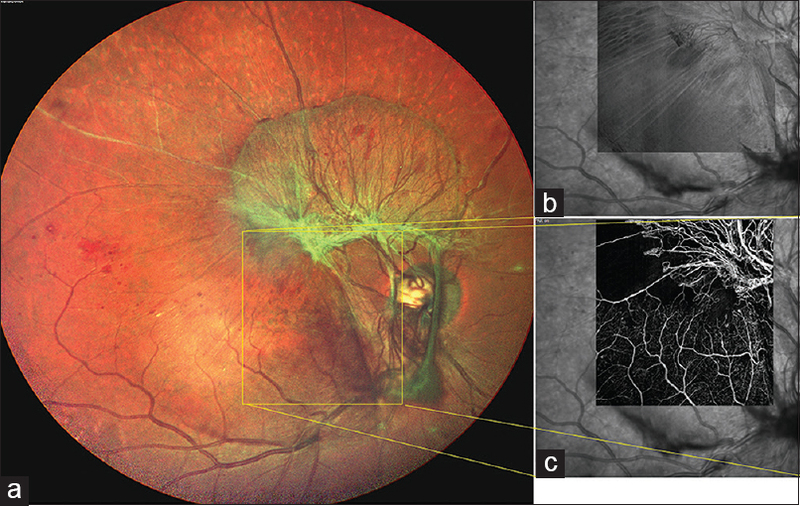 Reports of hyperhomocysteinemia, hyperviscosity syndrome, connective tissue diseases, and thrombophilia  with retinal vein occlusion in young patients are well known. If screening for these associations is inconclusive, a complete thrombophilic workup can be considered. OCTA in retinal vein occlusion can show nonperfusion areas, collaterals, and neovascular fronds. During the follow-up of these patients, fundus photography and OCTA can help to individualize treatment and follow-up options. OCTA acts an no invasive method to predict the visual prognosis. Marcucci R, Bertini L, Giusti B, Brunelli T, Fedi S, Cellai AP, et al. Thrombophilic risk factors in patients with central retinal vein occlusion. Thromb Haemost 2001;86:772-6. Chiang CC, Begley S, Henderson SO. Central retinal vein occlusion due to hyperviscosity syndrome. J Emerg Med 2000;18:23-6. Batioǧlu F, Atmaca LS, Karabulut HG, Beyza Sayin D. Factor V Leiden and prothrombin gene G20210A mutations in ocular Behcet disease. Acta Ophthalmol Scand 2003;81:283-5. Rehak M, Krcova V, Slavik L, Fric E, Langova K, Ulehlova J, et al. The role of thrombophilia in patients with retinal vein occlusion and no systemic risk factors. Can J Ophthalmol 2010;45:171-5. Tsai G, Banaee T, Conti FF, Singh RP. Optical coherence tomography angiography in eyes with retinal vein occlusion. J Ophthalmic Vis Res 2018;13:315-32.